Greek Marseille and Mediterranean Celtic Region / sous la dir. de Sophie Bouffier et Dominique Garcia. New York : Peter Lang 2017. 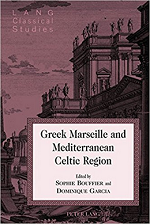 334 p.
This unique collection of essays contains a synthesis of recent works by distinguished archaeologists and historians in their field, illuminating extensive research in the Southern Gaul and on the territory of the Greek city of Marseille. Investigating the occupation of Massalia territory before the foundation of the Greek city to the Roman period, these findings provide an overview of the diverse issues behind the circulations between Greeks from Phocaea and Celtic populations. This reflection on a key region of the Euro-Mediterranean space rests on the analysis of archaeological findings, including : urban excavations, spatial studies, analysis of necropolis, submarine remains, paleo-environmental data, and reviewing the ancient literary documentation. These new and innovative findings in Greek Marseille and Mediterranean Celtic Region will be of particular interest to both students and scholars exploring the political, economic and cultural fields of relationships between the Greek migrants and the populations they started to meet at the end of the seventh century BC.